(1) The Flood of Noah's Day was the greatest disaster in the history of the world. This flood was a far greater disaster than the sinking of The Titanic, or any of the other disasters of the past. In fact, only eight people in the entire world lived through this tremendously tragic worldwide disaster. All of the other millions of people, (if not billions of people), living on the Earth in that day, drowned during this great flood. Therefore, in what way is this story of mass death a "Children's Story" to be so glibly told to young children? (2) Noah was a righteous man. Nevertheless, the flood was a judgment sent by God upon a world that had become filled with wicked, violent unbelievers. These evil men and women committed so much violence and sin on the Earth that God was left with no other choice but to judge the Earth with a great flood. (3) This is not a "story" like "Goldilocks and the Three Bears" or "The Three Little Pigs". No, this Flood actually happened, with an incredible amount of physical evidence which can still be seen throughout the world today, showing that it did indeed happen. This scientific evidence is also well documented. The huge weight of scientific evidence just cannot be simply ignored, as if this were just some kind of "Children's Story". There are whole books describing some of the voluminous scientific data proving that the Flood of Noah's day was a fact, and not a mere "children's story". At the top of this page is a photograph of the South Rim of the Grand Canyon. Please note the obvious: that there is shockingly little erosion on the top "rim" of the Grand Canyon, (a canyon which was supposedly formed hundreds of millions of years ago through the gradual natural processes of erosion). If you will look again at the above photograph, you might notice that the sides of the Grand Canyon go almost straight up and down. (In fact, they actually do go straight up and down in quite a few places along the canyon.) If gradual natural processes of erosion formed this Grand Canyon, and not Noah's Flood, then the top edge (or "rim") should be rounded, and not an edge at all, since the gradual processes of erosion always tend to round out sharp edges, not create them. In fact, after hundreds of millions of years, these same processes of erosion, (which those who believe "The Story of Evolution" claim formed the Grand Canyon), would have turned any such edges that might have once existed into gradual slopes. 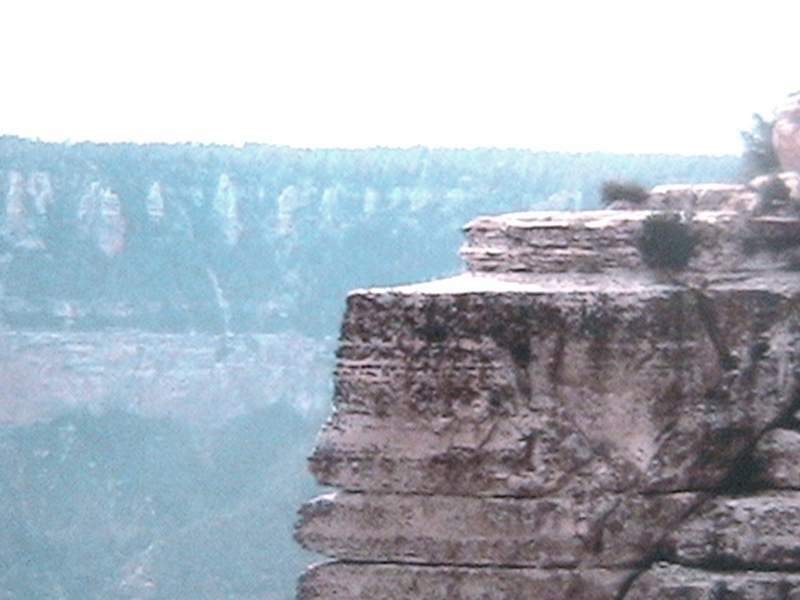 In this photo above, you can see a tree growing in the foreground at the left, next to the very edge of the Grand Canyon. This photo was taken from the very edge of the rim of the Grand Canyon, looking down into the canyon at about sunset. Normally, the roots of vegetation, (such as can be seen in this photograph), tend to quickly break up such soft rock formations, hastening the natural processes of erosion caused by wind, rain and snow. You can actually see the effects of such erosion in this picture, with many small pieces of rock next to the tree's roots having been broken off from the main rock surface. You can also see just how steep the sides of the canyon really are by looking at the darkened facing cliff to the left of center in this picture, and noting its almost vertical edge. Here is another picture of the top edge, or "rim" of the Grand Canyon. 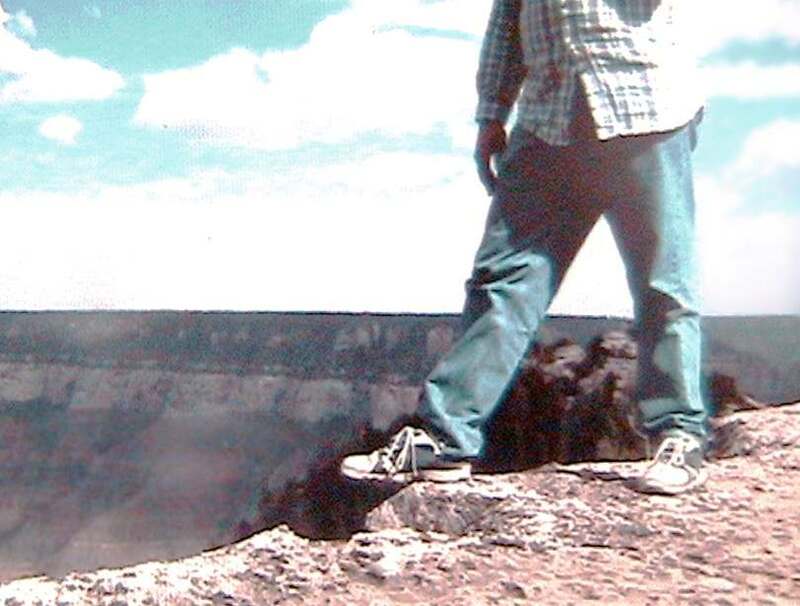 I found that while I was standing on the rim of the Grand Canyon, I could actually place the tip of my shoe over the "edge" of the Grand Canyon, with the back of my shoe firmly standing on the flat rim surface. The front of my shoe was hanging over an edge that went straight down for hundreds of feet! 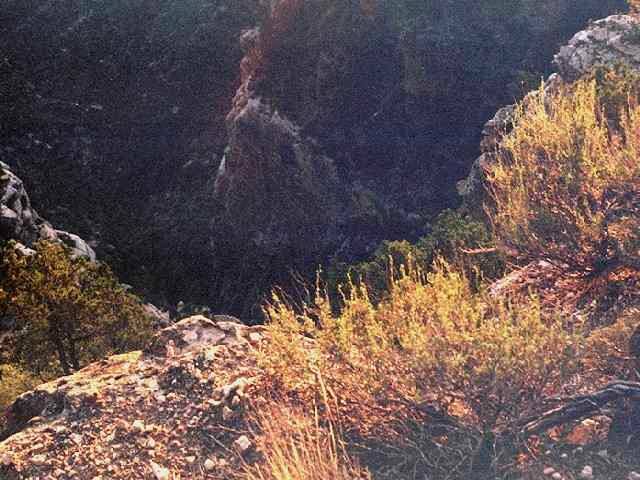 Above is another photo of the Grand Canyon for you to consider. 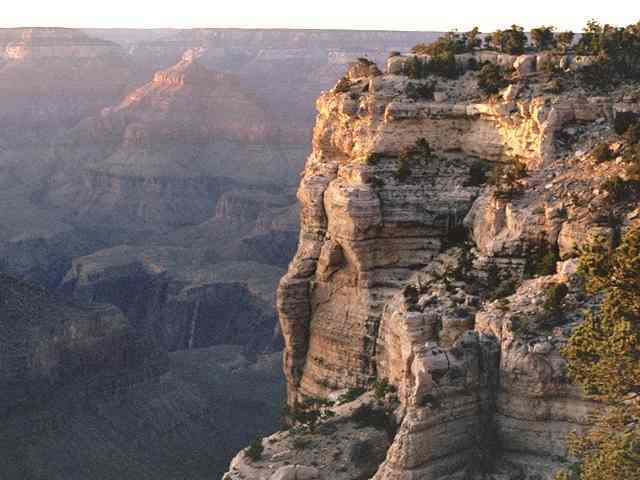 The Grand Canyon is about a mile deep from the rim at the top to the Colorado River way down at the bottom. Although magnified in this telephoto image, the Colorado River actually looks very small from the top rim of the Grand Canyon. From the rim, the Colorado River in fact looks like a small bluish-black line way down at the bottom of the Grand Canyon. No, I am sorry, but this tiny little river at the bottom of the Grand Canyon could not have carved out a huge canyon a mile deep and many miles wide right out of solid rock! This is just common sense. Now here above is another picture of the Grand Canyon. I call it the "Slice of Cake". The right photo is a close-up of the same view as the left picture. The left photo covers about thirty feet vertically from the bottom of the picture to the rim edge and the right picture about six feet. 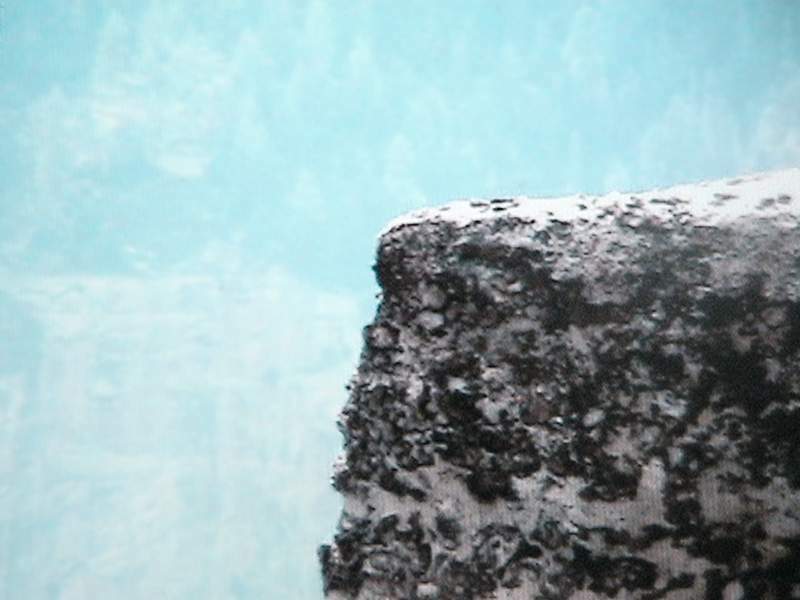 Erosion of this edge is only a few inches in radius, as can be clearly seen in the right photo by the scant amount of erosion at the left edge of the rim. The angle of the top of this edge is only about 30 degrees from side. Also, both sides of this "knife edge" rock formation drop down for hundreds of feet. Now, you tell me. How could, as evolutionists claim, this "crisp" and "sharp" geological feature have been cut right out of solid rock over "millions of years through steady, gradual processes operating over very long time periods of thousands or millions of years"? The implications of the above photo are also amazing. 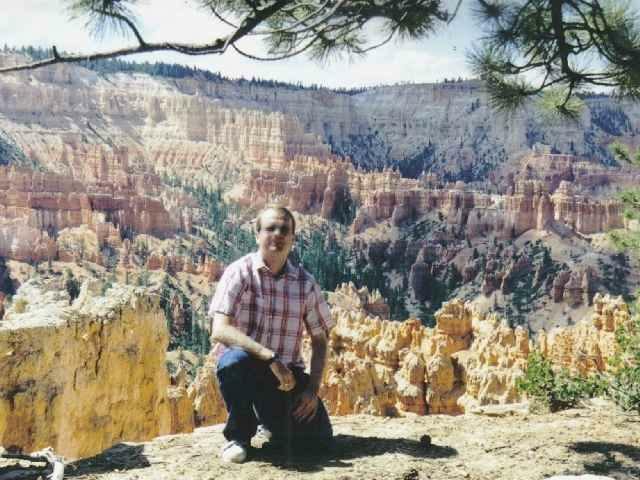 This photograph was taken at Bryce Canyon National Park in Utah. Bryce Canyon is at a higher elevation than the Grand Canyon, but is still fairly close to the Grand Canyon in the Southwestern United States. Because of their size and proximity, it is clear that both the Grand Canyon and Bryce Canyon were formed at the same time. Nevertheless, there is one apparent difference between the Grand Canyon and Bryce Canyon - the features in the rocks at Bryce Canyon are mostly vertical and not horizontal as they are at the Grand Canyon. Note the many and complex vertical erosion lines in the rock formations. There appear to be many more vertical rock features than horizontal ones. The only logical conclusion that one could come to from observing such patterns in the rocks at Bryce Canyon was that they were formed by vertically flowing water, (yes, that's right, by water flowing vertically.) Normally, one would have expected to see such features form horizontal lines if they had been formed by water (or by wind) which flowed from side to side (horizontally). 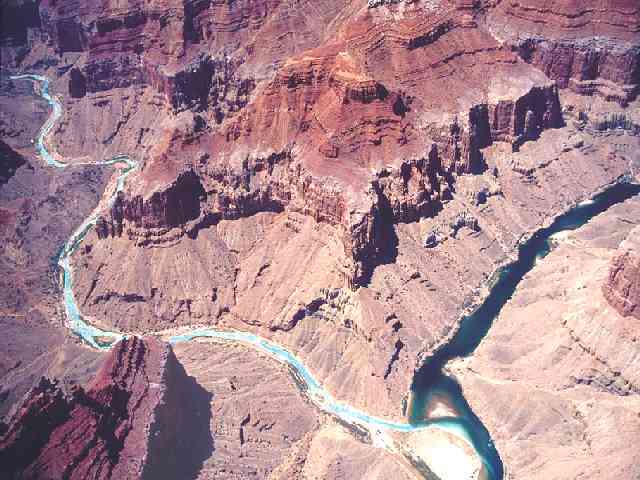 The complexity of such features could not have been formed by horizontal water flow, since the cutting of these lines is not patterned in any one particular direction, as would have been the case, (and is the case with the Grand Canyon), if they were formed by water flowing from one side to another. Also, please consider that normal rain, snow or wind could never form such features in solid rock. 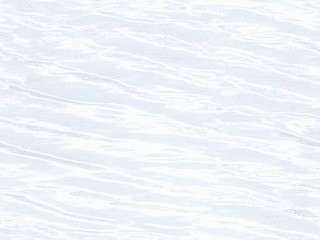 Instead erosion caused by normal rain, snow and wind tends to erase such features, not form them. Now ask yourself, how could tremendous amounts of water -- enough water to cut delicate features right into solid rock, --, flow vertically at more than a mile high elevation? The only way that this could have occurred was through the tremendous water flow of a cataclysmic flood -- the exact event described in the Bible as actually having happened back in Noah's day. There are also some other amazing facts to consider as well. Look again at the photo above. This is right near the edge of a cliff on very soft rock that was probably formed by volcanic ash deposits. The cliff drops straight down for hundreds of feet. Nevertheless, this "edge" has a radius of only 2 or 3 inches, just like I saw back at the Grand Canyon. Look also at that large rock formation to your left at the bottom left of this picture. Now look at right edge of this yellow rock formation. This rock is yellow, apparently containing a high sulfur content. (Sulfur is a soft yellowish element.) The top edge of this soft yellow rock has a radius of only a couple of inches as well. In fact, this soft rock's top edge is so crisp that is almost looks like cheese that has been sliced with a knife! The fact is, there are examples of sharp edges such as these all over both The Grand Canyon and Bryce Canyon National Park. This is in spite of the frequent effects of wind, rain, snow, vegetation, (see the trees and plants? ), and lots of wild animals such as goats running around and grazing. Clearly, therefore, these rock formations could only be a few thousand years old at the most. If it were any older, there would be no sharp edges at all in such soft rock formations. Instead, all of these sharp edges would have long since been worn down by the effects of various types of erosion. This illustration above shows the type of person who could see this tiny fraction of the enormous weight of scientific evidence supporting Noah's Flood and yet still claim that "these rock formations were formed over hundreds of millions of years by slow, gradual, evolutionary processes". Such a person would deny that Noah's flood was in fact a real and factual historical occurrence - an historical occurrence with plenty of scientific evidence to back it up. Such a person could see the obvious, (such as these photographs right in front of him or her), and yet still deny the very facts shown by those same pictures! How could this be? I will tell you how. 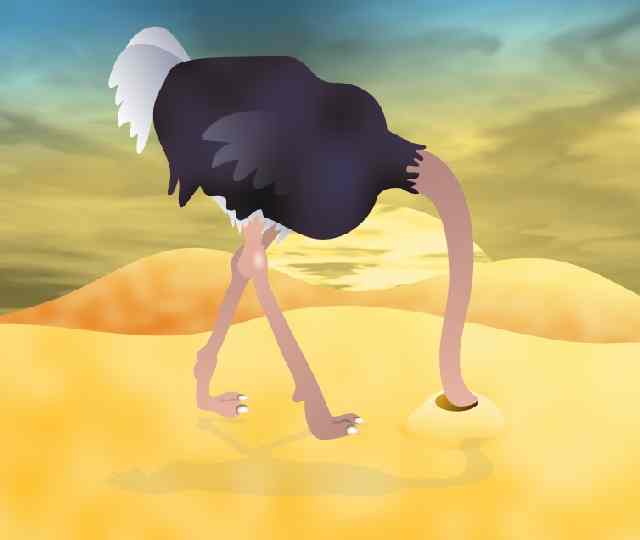 It is called, "putting one's head in the sand". Here is a typical "Noah's Ark Story" drawing from someone out there on the Internet. Please carefully notice that, in this drawing of Noah's Ark, everyone is smiling and happy. It gives the impression that almost all the people and animals in the whole Earth are not about to drown in a violent worldwide cataclysmic flood. The boat is also made to look as if it was only a few feet long - much too small to actually save two of every type of animal on the Earth from extinction by such a flood. Further, everything in this drawing has a "cartoon" air to it, as if "Noah's Ark" was just some kind of joke or "Children's Story". Such a drawing represents exactly those things that the Devil, (the one who inspired people to make drawings such as these), would want you to believe - that Noah's ark is just some kind of nice "Children's Story", but "didn't really happen". No, Satan is a liar, and the father if it. Instead, the Flood of Noah's Day can and should be taken very, very seriously. The reason that you should take it so seriously is that the same God who, (because of man's sin), destroyed the Earth with water will one day destroy it again through fire. Sin must be judged by a Righteous and Holy God. Because God must punish your sins, you must therefore go to Hell with Satan and his demons when you die. 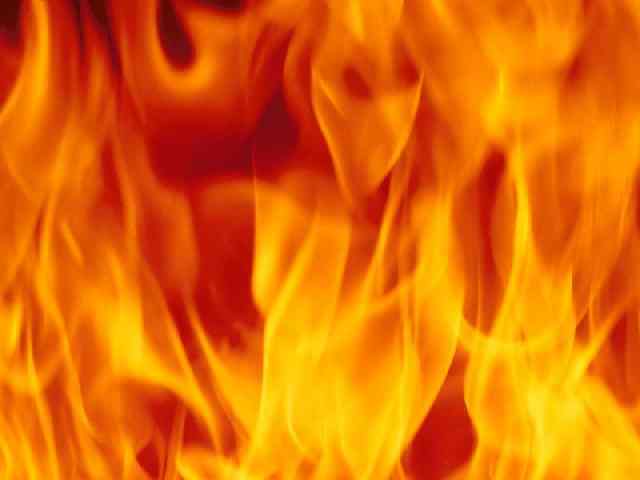 God does not want you to die and go to Hell as punishment for your sins. Nevertheless, God must still punish your sins, because God is just, and you really do deserve to go to Hell as punishment for your many, many sins. God has provided a way for you to escape from being punished for your sins. God punished Jesus in your place on the Cross. By doing this, Jesus paid the penalty for your sins on the Cross. Jesus did this for you, even though Jesus never sinned. Noah believed God when God told him about the Flood that He would bring upon the Earth as judgment for Man's wicked sin and rebellion against Him. Noah therefore built an Ark as God had commanded him to do. This Ark saved Noah and his family, as well as two of every type of animal on Earth. This Ark was a "type" of Jesus. By "type" we mean that the Ark was a picture in advance of how Jesus would save people from their sins who trust Him to save them. Those who trusted God's Word in Noah's day came into the Ark, and were therefore saved from the waters of this great flood. Those who refused to believe what God had told Noah did not go into the Ark. These unbelievers all died in the flood, just as God had warned them through Noah's preaching. What about you? If you do not trust Jesus, then there is no other hope for you to be saved from God's punishment for your sins. There was only one Ark in Noah's day. There is only one way to be saved from your sin. That one way is Jesus. If you trust Jesus, then He will save you. Will you trust Him and be saved?